Our spaworld offers you unique opportunity to discover the secrets and pleasures of the exotic Russian steam sauna banya and the hot tub in the open air. Please make an order with your preferred starting time at least one day in advance either sending an email to info@kivitalu.com or in the reception after your arrival. 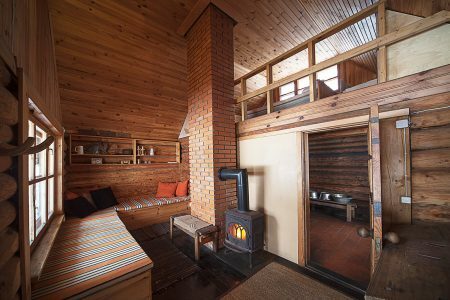 RUSSIAN SAUNA BANYA with its huge stove and heated stones, sizzling hot steam, birch brooms and smoky walls gives you an exotic and unforgettable experience of a lifetime. 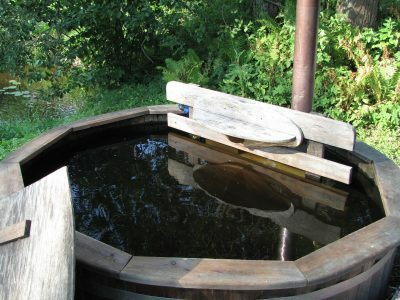 Like in old days, our banya does not have tap water. The water in large tubs comes from the lake and is therefore, thanks to peat, soft and little yellowish in colour. And just like in old days hot water is heated with firewood. To cool off your hot body splash into the lake, pour yourself over with cold water, relax in the hammock on the banya terrace, or sip Kivitalu refreshing well-water. NB! It takes 8 hours to heat Russian sauna! HOT TUB in the open air just next to Russian sauna is a wonderful place to unwind, sitting in the comfort of hot water barrel, chatting with friends, looking at the stars above. Price: 200 € per visit. Price includes heating Russian sauna and hot tub, Kivitalu birch brooms and the use of bath towels. NB! Please do not take to sauna towels from your cottage.